Using the WP Fusion Ecommerce Addon with ActiveCampaign allows you to track customer sales and lifetime revenue from your WooCommerce, Easy Digital Downloads, or LifterLMS store within ActiveCampaign. Note: Deep Data integration with ActiveCampaign requires a Plus level plan or higher. 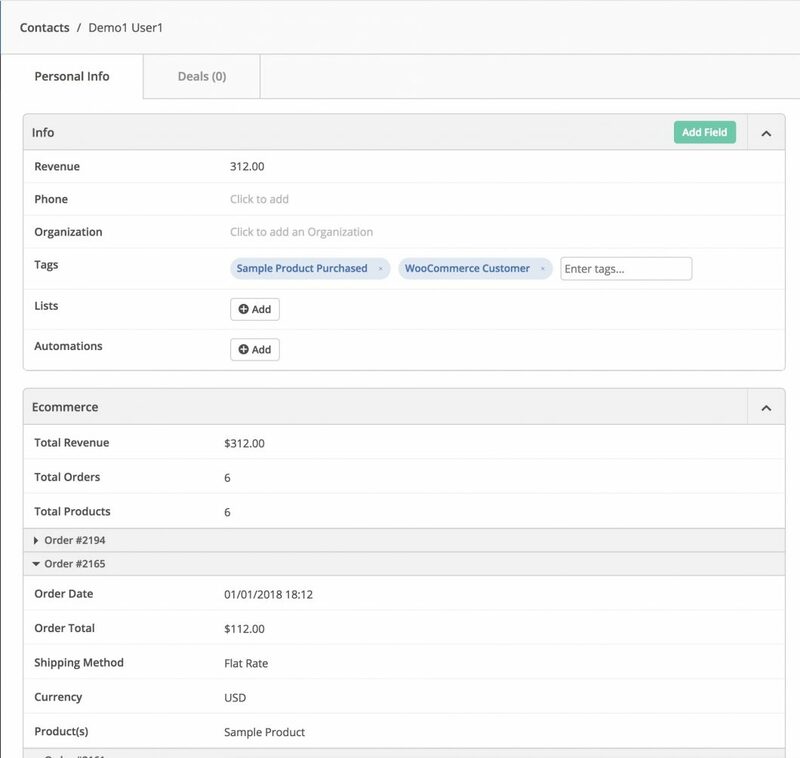 Version 1.2 of the Ecommerce Addon includes beta support for ActiveCampaign’s new Deep Data API. On the addons tab in the WP Fusion settings, check the box next to Deep Data and save the settings to initialize the connection. In your ActiveCampaign account, navigate to the settings and click on the Integrations tab. You should see WP Fusion listed. Any sales made with WooCommerce, WooCommerce Subscriptions, or Easy Digital Downloads will be added to the corresponding contact record using the new deep data display. 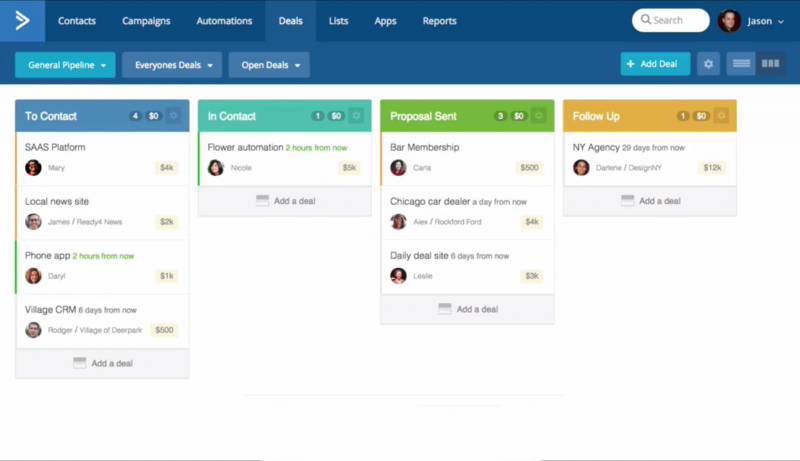 ActiveCampaign will automatically track lifetime revenue, total orders, and total products purchased for the contact. Note: If you’re using our Deep Data integration with ActiveCampaign, revenue tracking is handled automatically by ActiveCampaign. You only need to set up revenue tracking if you’ve elected not to use the Deep Data API. 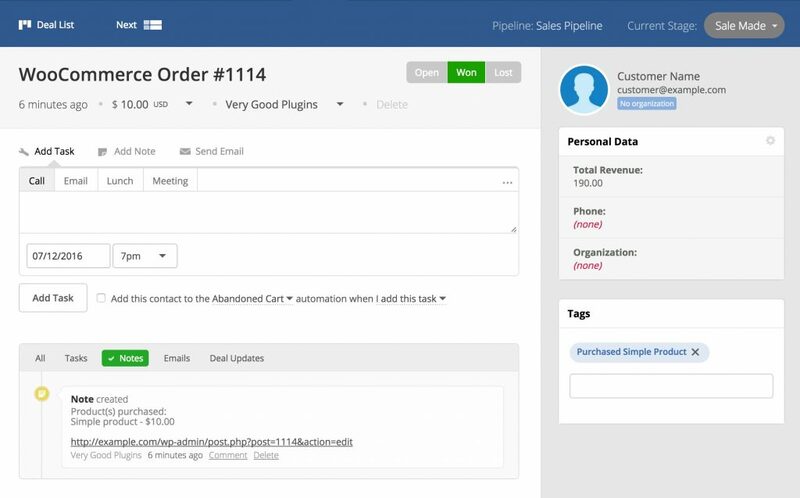 To set up revenue tracking, first create a new contact custom field in ActiveCampaign. This field will be used to track the total amount spent by a customer in your store. If the field doesn’t appear in the Total Revenue Field dropdown, begin typing the name and click “Resynchronize” at the prompt to load the new custom field from ActiveCampaign. Whenever a customer checks out on your store, this field will be incremented with the total value of their purchase. For more advanced ecommerce automation, ActiveCampaign’s Deals system is one of the best systems available. Using the Ecommerce Addon, WP Fusion can create deals in ActiveCampaign with the order value and other details, and associate those deals with the originating customer. Note: The Deal settings will be hidden if your ActiveCampaign account doesn’t support Deals, or if you haven’t created any Pipelines or Stages yet. If you’ve just created a new Pipeline, click Resynchronize on the Setup tab to reload the available Pipelines and Stages. The settings should now be visible. To enable deals tracking, first check the box next to Deals in the Ecommerce Tracking settings. Next select a pipeline and stage where new deals will be inserted (deals can later be moved using automations). If you’ve just created a pipeline or stage and it doesn’t appear in the list, go to the Setup tab and click Resynchronize to reset the list of available pipelines and stages. Once enabled, deals will be added to ActiveCampaign like in the screenshot below. Using ActiveCampaign’s Automations you can move deals between stages, create followup tasks, set deal statuses, and much more. The possibilities are beyond the scope of this article but feel free to contact us for ideas on how to best create a workflow for your business.